February 2, 2015 / Admin for ACF / Comments Off on ACF Supports Project S.A.Y.
Erick Samayoa has been a resident of Anaheim for 10 years and was a participant in Project S.A.Y. from 2006 to 2010. In 2010 he was accepted to The Citadel, The Military College of South Carolina, and is now serving on the USS Anzio as a naval officer. During 2013 he returned home to help out with the Project S.A.Y. Cycling Team. Thanks to donations from City of Anaheim Employee Giving program to the Anaheim Community Foundation (ACF), the Project S.A.Y. Cycling Program received funding through ACF. “As I look ahead and plan for this coming summer, I can’t help but reflect back on an opportunity I had last year that created an indelible memory, and an ongoing opportunity for me to help lead younger people who share a passion for cycling. I volunteered with a city sponsored youth development program called Project S.A.Y. (Support Anaheim’s Youth). The group was rejuvenating the youth cycling program and I had the opportunity to lead them in their workouts. After all, I knew very well what it was all about after being in the same program throughout my high school career at Anaheim. My time as a participant-student with Project S.A.Y. inspired me to begin competing in triathlons and I eventually became captain of The Citadel Multi-sport Team, which also helped me in my quest to inspire the Project S.A.Y. students I was coaching. These middle and high school students rode an average of 25 miles twice a week during a three month period. There were 12 students on the team. As I worked to lead them, I tried to teach them about cycling safety, equipment maintenance and nutrition. I also shared strategies about how to effectively pace themselves while cycling in preparation for an upcoming marathon. In addition to cycling, we played games of basketball on the city’s basketball courts after morning rides. 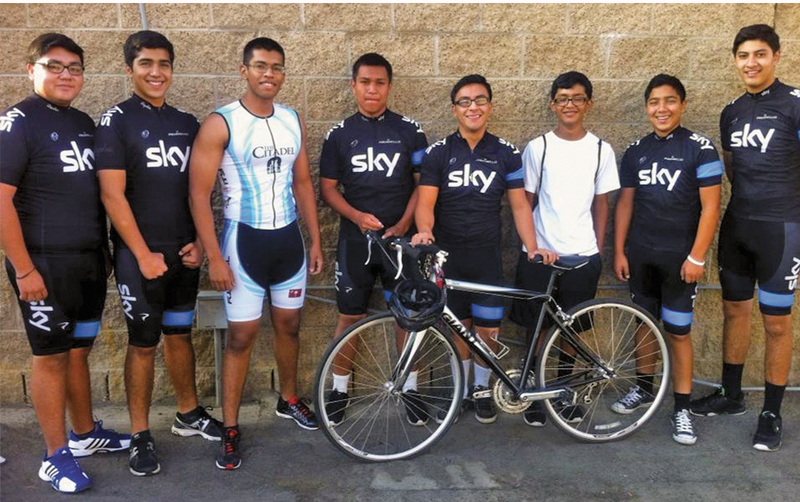 The Project S.A.Y. Cycling Team is just one example of the many free programs that are available to Anaheim youth in middle school and high school. Although the cycling program is full at this time, many other activities are available. Call 714-765-5246 for more information! Your donation to the Anaheim Community Foundation directly impacts lives right here in Anaheim! Your donation directly impacts lives right here in Anaheim!